While walking around in Venice, I accidentally stumbled upon Libreria Mondadori - a three floor building, the largest bookstore in the city and a home to thousands of books in various languages. Another interesting thing about this bookstore is that it's illuminated by natural light, which enters through huge windows and the glass ceiling i.e. a skylark on the top. so if the weather conditions are favorable you can enjoy your browsing in daylight. The ground floor of the bookstore is primarily occupied by books on Venice (and Italy itself): guidebooks, calendars, books on the history of the city, the arts, people, etc. These can be found in Italian, English, German, French and many other languages. The second floor is home to fiction and non-fiction titles, with the Italian section occupying most of the space. In the far back, just past the internet spot (yes, there are computers you can use there), a small room holds mostly titles in English, German and French. Although small, the selection is well-worth checking out, as every passer-by in need of an English read should be able to find something for his or her liking. This specific Mondadori bookstore can be found near the famous Piazza San Marco, in a building which formerly housed the San Marco cinema. 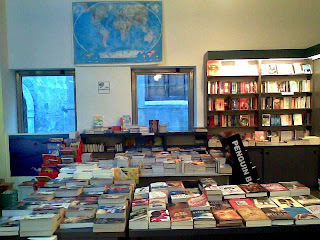 The space has been turned into a huge bookstore which opened its door to visitors on the 13th of February 2004. Libreria Mondadori also plays an important role in the local cultural sphere as it organizes readings, discussions, conferences and other events usually related to litterature or the history of Venice, which are held at the SpazioEventi - a huge room of about 300 square meters above the bookstore. Besides the mentioned internet point there is also a reading room, so Libreria Mondadori really offers a complete service to all its visitors. 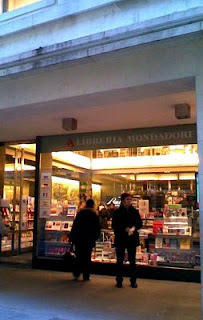 I'm sad to report that Venice's Libreria Mondadori has gone out of business. The staff served an aperitif to customers and closed the shop's doors for the last time on January 6, 2011.